Like the process of staining wood, “staining” grout with paint is a process of wiping on and wiping off. The paint sticks to the rough grout but wipes off the glass tile. The reason I say “stain” in quotes is that even though the grout is porous and there should be some penetration like a wood stain penetrates wood, there should still be a surface coating of paint over the grains of sand. Note that if you wipe the paint off too aggressively, the light grains of sand at the surface will be exposed. TIP: Wipe the paint on and off relatively quickly so that it doesn’t have time to harden on the glass tile. Acrylic paint dries very quickly. If you do have some paint dry on the tile, you can take it off with a ScotchBrite pad. 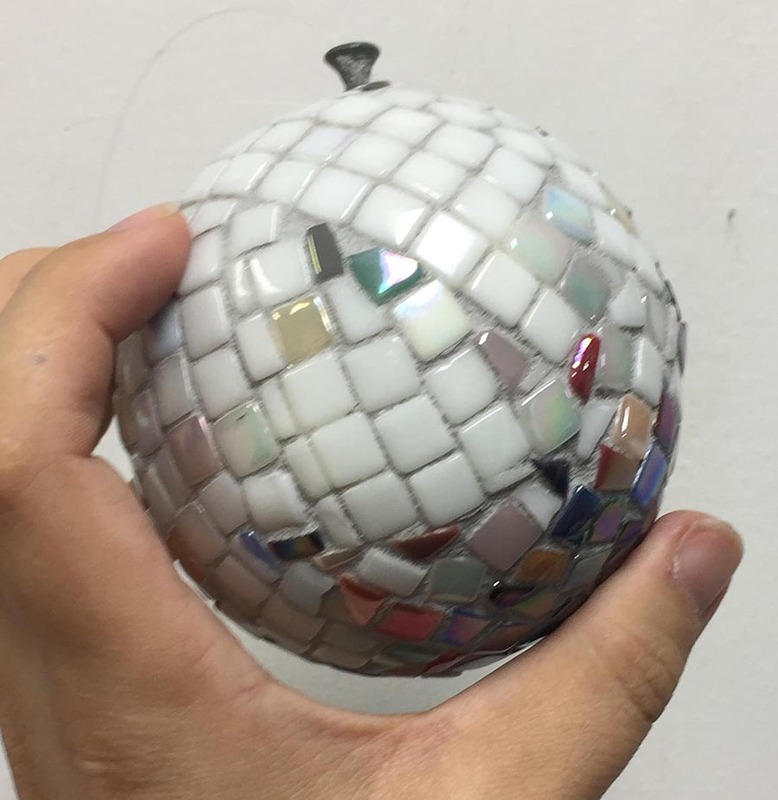 Recently employee-artist Angela Bortone made a mosaic Christmas ornament from one of our hard polystyrene kits, and she used a light gray grout with white tile, and so the grout didn’t provide enough contrast. 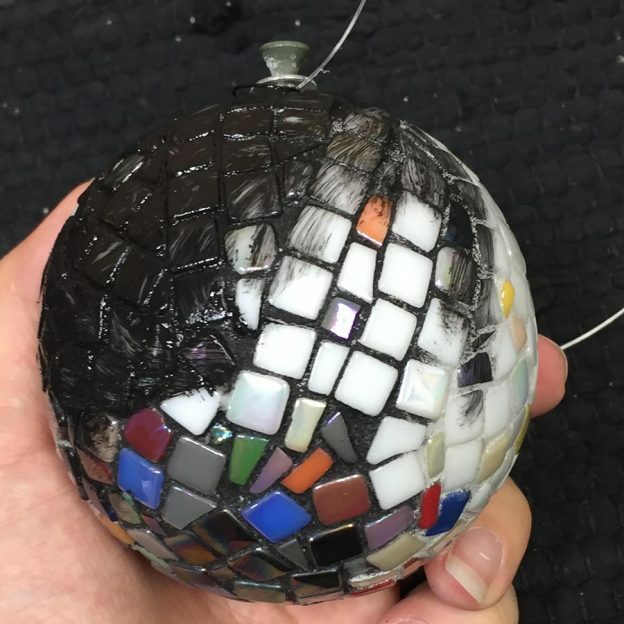 Mosaic Christmas Ornament with Light Grout. Notice how the grout provides enough contrast for individual tiles to be visually distinct but not enough contrast to add visual interest. Angela used this problem as an opportunity to try out staining the light grout with black paint so that there would be maximum contrast with the white tile. some tiles, while beautiful, are not flat. What do you do when grout get into the nooks and crannies of your tile? I don’t mind grout in the occasional pit or crack because I am trying to make something that looks old and weathered. People who want to remove all residue use brushes and dental picks. Thanks, Joe for replying to my question. I really like your advise. 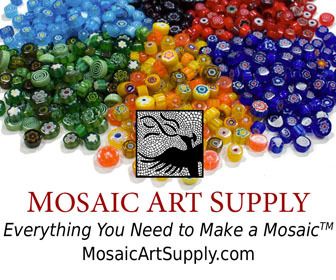 When mixing acrylic paint with grout for a specific color what is the ration? There is no specific ratio. You simply mix in the acrylic paint until you get the intensity of color that you want. I don’t think it is possible to add so much paint that it will not harden (because acrylic paint will harden on its own), but you can add so much paint that the grout looks more like plastic than concrete. My indoor mosaic grout dried too light and i was advised that I could darken it by using a wash (water mixed with acrylic paint) of a darker colour. Will this work and is there a ratio of water and paint I xhoukd follow. I would use only minimal water applied by misting as needed instead of mixing water in with the paint. The paint should stick to the porous grout but wipe off the glass tile, but you have to get it wiped off before it dries. That is why the misting water bottle comes in handy. If you do decide to mix in some water, use only about 5% to 10% tops. I hope helps.